I had another solid week of training, I’m really enjoying being back in the three sport world. I love feeling like I’m making gains in different areas, compared to just run focused training. This was another early morning bike ride in my living room. I did Sufferfest Local Hero. It was challenging like always, but I’m happy with this workout. Tempo Run with my local running store. Every Wednesday they have a group that runs about 6 miles then heads to the bar for drinks afterwards. I’m never able to hangout for the drinks afterwards, but there is always someone to help push the pace more than I do for tempo runs on my own. Need to start going to these more! This was by far my toughest workout of the week. It involved lots of pulling drills at very specific time intervals. The paces were pretty challenging, so I missed a few of the assigned intervals, but was able to stay fairly close to where I was supposed to be on little to no rest between intervals. I’m looking forward to getting another shot at this workout again soon. The trail we ran on is made up of a really fine gravel (think kitty litter) and was sloppy due to thawing out and rain earlier in the week. We sloshed around the whole time, so my footing was a little more loose than I’d like, felt a couple twinges of soreness in my knees after this run. Next I took Copper, my lab/hound mix out for his turn. He loves to stop and sniff so we definitely don’t get to keep a constant pace on his runs, but he did pretty well this time….we probably only stopped about 10 times on our 1.1 mile run. 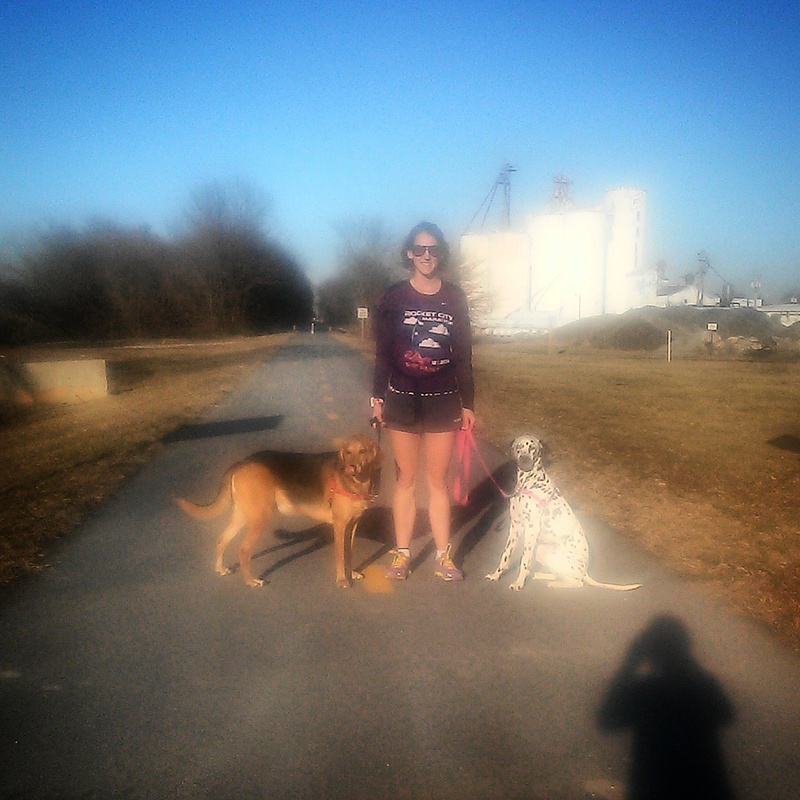 My dogs and I posing after our bike trail runs. It was a fun day and I was so thankful for the weather and the time off school to enjoy it. I went to Runwell for this run as well. I have a hard time on solo long runs, it just always seems to go better with company. My legs are definitely not used to running somewhat long miles two days in a row and felt tired for this run. I focused on my breathing to gauge my effort instead of my legs. Although it was probably a harder effort than an easy long run should be, it was still pretty close I would say. Happy with this pace, especially since I’d run 7 the day before. I really wanted to get in an outside ride this weekend with the mild weather just to see where my outside bike base was at the start of training. I’ve read that there is a difference in trainer riding vs. outside riding and you should expect the trainer to be slower, but I wasn’t sure just how much. Since I’d spent very little time on my bike since October, my first few weeks of trainer rides have been a bit discouraging to see how much my speed had fallen. I studied the weekend forecast daily trying to decide what to do. Saturday was warmer but had very high winds. Sunday was cooler but less windy. After Saturday’s long run in the morning my legs were tired and I decided to go for Sunday when I wouldn’t have to fight as much wind. Sunday ended up being cooler than what they forecasted, go figure. When I left my house it was 49 degrees, but since it was already 2:30 at that point, the temperature only fell from there. Winds weren’t too bad, and the temp didn’t feel too bad starting out. It felt SO GOOD to be back out on my bike. I remembered why I loved it so much last year. I didn’t switch my sensors over from my trainer tire so just used my watch to keep track of speed and distance. I didn’t look down too often, but every time I did I was happy with what I saw. Without feeling like I was really pushing the pace, I was quite a bit faster than any of my trainer rides have been. I felt strong and definitely could have ridden further under warmer conditions. I ended up deciding that my feet were getting pretty cold and decided to turn back and cut my ride a little shorter than planned. But I’m happy with it and can’t wait for spring when I can do more consistent outdoor rides! 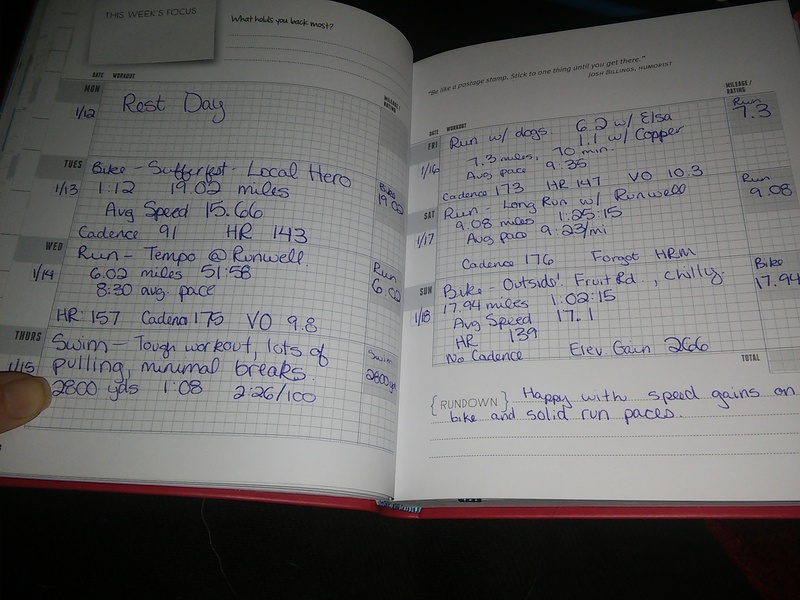 My plan for the coming weeks is to focus on strength and speed. I know that increasing distances are going to happen as races get closer and I want to take advantage of this time to be more ready for that. My plan is to incorporate some core and strength work each day, add more hills to my running and keep pushing myself on my Sufferfest videos. Stopped on my outside ride to take a picture. Gotta have proof of an outdoor ride in January! Way to get going! Are you using a coach or are you doing this on your own? We must meet up at Boulder this summer! Keep up the great work! I am using a coach, as of last week, ha! 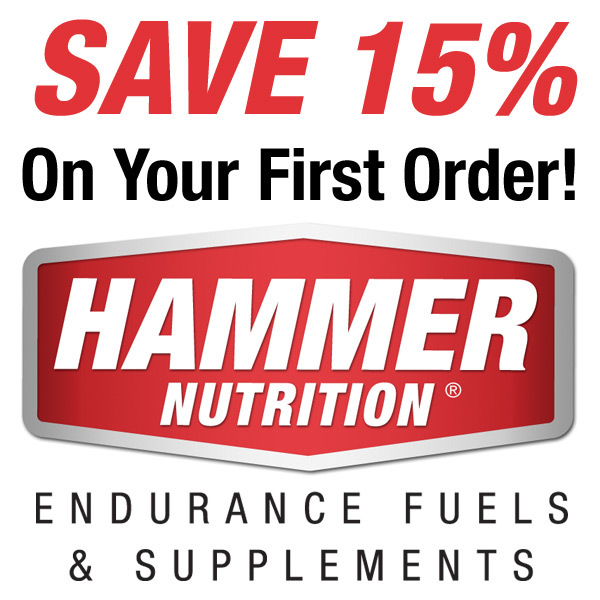 I decided with taking on my first ironman and still being quite new to the triathlon world, I wanted to have some guidance making sure I do it safe, but challenge myself enough. The workouts so far have been really great, a little more of a challenge than what I would have done myself but attainable so that I feel great about it when I’m done! Definitely a Boulder meet up! Excited that you’re doing it too! Getting a coach was the best thing I did for Ironman Arizona. After reading about your week I’m very happy I’m not in a three sports world lol. Running is enough for me! I suggest using your heart rate monitor on the second run of a back to back run. Most people can run hard without the metrics to guide them, but a lot of people don’t run easy enough of their easy runs. Run your easy runs at 60-70% of max. Doing several hard runs in a row may seem like the best workout, but your body benefits more from a hard easy approach. The easy runs are vital for endurance.